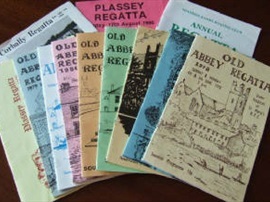 During the era of the Abbeymen many Regatta's were held at different venues and poling was the main attraction. Keen rivalry, excitement, thrills, spills and much more made for simple enjoyment. After the Abbeymen ceased operations in the late 1930's, regatta's were only sporadic events and poling a boat nearly faded into oblivion. 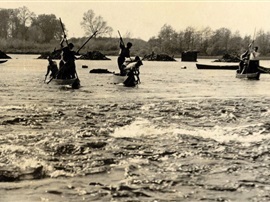 The brocauns were disappearing from the rapids of Corbally, Plassy, Doonass and Castleconnell. One remembers the Strand, Curraghgower, Abbey and Plassy regatta's of the 1930's in which the prizes were much needed hard cash. 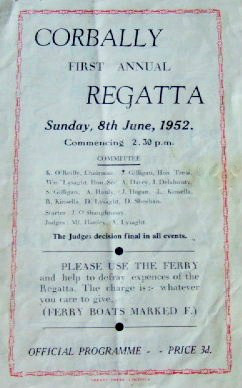 A revival of these regatta's took place in Corbally at 2.30 p.m. Sunday, 8th June, 1952 in which amateur status for trophies was introduced. 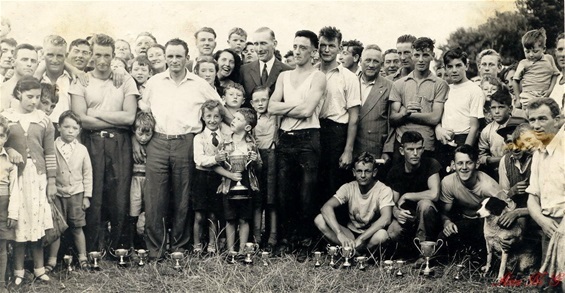 PRIZE WINNERS AND SPECTATORS CORBALLY REGATTA 1953. From left: Susan Kinsella, Larry Kinsella, Johnny Delahunty, Martin Hogan, Pat Lysaght, Fergie Collins, Connie Kerley, Greg Clancy, Joe O'Shaughnessy, Densie Cowhey, Joxer O"Shaughnessy, Peter Fagan, Larry Devaney, Willie Duhig, Nay Lysaght, Jimmy Duhig, Johnny Hogan, ? O'Brien, Mrs. Hogan, Joe Gilligan, Matt O'Brien Florency O'Mahony, Donal Lysaght, Arthur Lysaght, Austin Sheehy, Teddy Murphy, Monica Byrnes, Terry Gillilgan, Mrs. Frahill, Mrs. Gilligan, Mrs.Collins, Kevin O'Reilly, Mikey Collins, Theresa O'Shaughnessy, Mr. & Mrs. Pat Hogan, Michael Hogan, Gerry Hogan, Joan Hogan, Ann Lysaght, Helen Gilligan, Liam Gilligan. 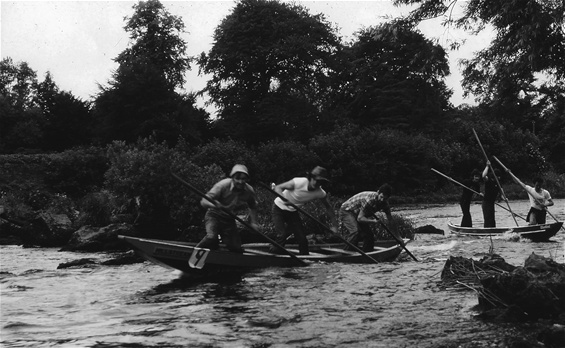 POLING RACE - CORBALLY REGATTA 1952. Lax Weir, starting point for all poling races. 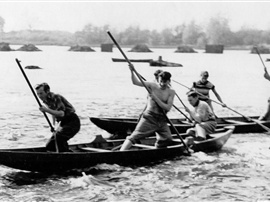 POLING RACE - CORBALLY REGATTA 1952. Tony Darcy, Dom Sheehan and Donal Lysaght taking the lead. 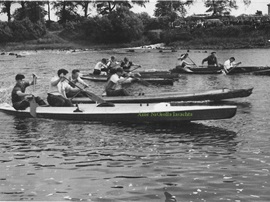 POLING RACE - CORBALLY REGATTA 1952. Tony Darcy, Dom Sheehan and Donal Lysaght. 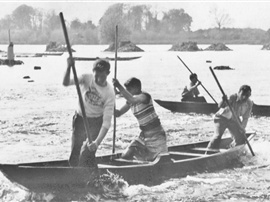 POLING RACE - CORBALLY REGATTA 1952. Seanie Gilligan, Johnny Delahunty and Nay Lysaght. Brothers Larry and Bob Kinsella and ?? in a spot of trouble in the boat behind. Pat Lysaght, Ger Stundon and Dan Gallagher. Poling is a very skilful and spectacular method of propelling a boat over rapids, shallows and fast currents. This method was practiced for centuries by the Abbey Fishermen in their brocauns. The brocaun is a flat bottomed boat similar to the angling cot seen here in the photos. Before the Shannon Scheme, the Shannon from O'Brien's Bridge downstream was in its glory, poling was a test of skill and strength, but the Shannon in an angry mood deterred even the Abbeymen. Poling in the past was performed by two men only, but when it was introduced as a sport a third man was included. The pole used was approx. 11ft. long and 2.5 inches in diameter, it was made of ash and at each end, to strengthen the pole it had an iron ferrule. 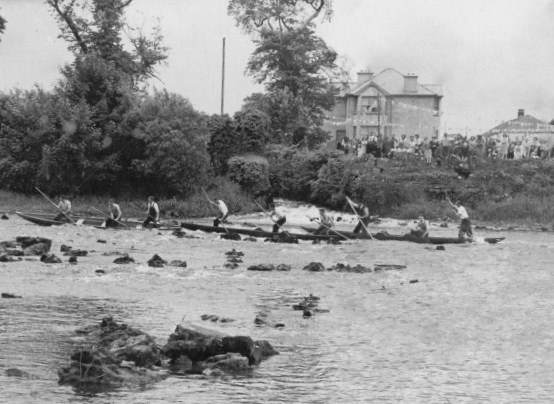 Crowds on the Green watching the Punt Race, Corbally Regatta 1952. 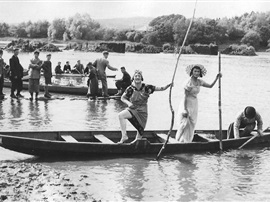 FANCY DRESS BOAT RACE -CORBALLY REGATTA 1952. Ladies in the boat are Seán Raele, Johnny Delahunty and ?? 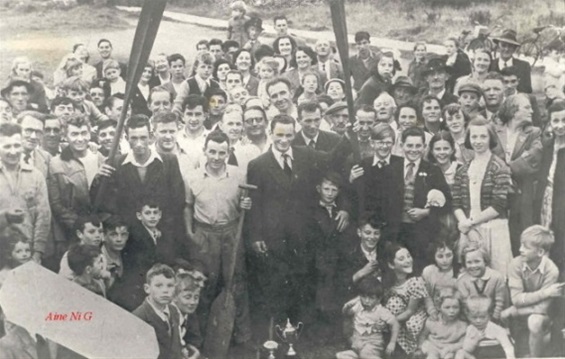 PRIZEWINNERS AND SPECTATORS CORBALLY REGATTA 1954. From left: Joan Hogan, Greg Clancy, William (Nay) Lysaght, John O'Reilly, Joe Hayes, Pat Kirwin, Fra Hayes, Tommy Cross, Jimmy Duhig, Willie Duhig, Gerard Hogan, Matt O'Brien Jnr., Aine Cross, Ald. 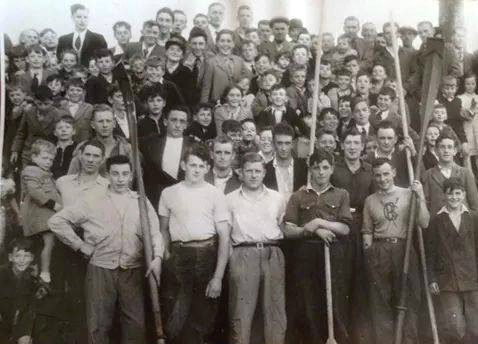 Ted Russell, Cyril Kiely, Austin Graham, Bob Kinsella, Hughie Flannery, Willie Woodland, Denis O'Shaughnessy, Martin Hogan, Tom Moloney, Dermot (Kokie) McNamara, Mick Hayes, Sean Kennedy, Freddie Bromell, Joe McNamara, Joxer O'Shaughnessy, Michael (Mikey Joe) Collins and Spot, Matt O'Brien. BLESSING OF THE BOATS - Fr. 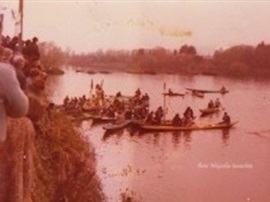 Holden a Jesuit Priest, keen fisherman, friend and lover of Corbally, performed the Blessing of the Boats Ceremony every year at the beginning of the boating season, from the Green at the end of Mill Road. And earned their rest to-day. As the last spectators go? The tud against the wall. They show their scars with pride. Thanks for the memories Ann. 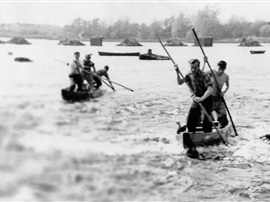 My father used to bring us to Corbally to the Regattas,the greasy pole and obstacle race were great,J not to mention the boat race.